The Oceanlinx Mk1 full scale prototype was fitted out and first deployed in 2005. 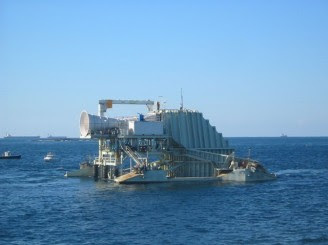 The approximately 500 tonne device used a parabolic wall to concentrate the wave energy into its 100 square metre Oscillating Water Chamber (OWC). The device made use of a Denniss-Auld turbine. The Mk1 Full Scale prototype was one of the first full scale wave energy devices in the world. Its operation between 2005 and 2009 has provided invaluable test and operational data guiding the development of subsequent designs. The device was located at Port Kembla, approximately 100km south of Sydney, Australia. Tests completed. Turbine testing was certified by Llyods Register. After being officially decommissioned in 2009, the structure remained in the water. While plans to remove the device were in progress, Oceanlinx was bankrupted in April 2014. As of 2016, the rusty device still remains in the water, while the government makes plans to remove the structure. As the device was located below the high water mark, the licensing for the device fell outside the jurisdiction of the local and state authorities. It was determined that authorisation of the project was required from NSW Fisheries, Maritime Authority of NSW and Department of Lands. A license for the area was granted by the State Department of Lands. This has rolled over from 2004 to 2011 to cover deployment of M2 and Mk3PC. There were no adverse environmental effects witnessed during operation. Oceanlinx MK1 is located in Australia. Was not affected by the installation of the device. No perceptible effect as the site is a low energy environment (10kW/m) and the device is positioned in front of the breakwater. Onshore physical environment consists of several breakwaters surrounding a large industrial site. No designated sites in the area. Low fish and fauna count on seabed, increasing amongst blocks that form breakwater. The site is on the edge of a large industrial port, N/A. It was determined that there was no effect on archaeology and cultural heritage. As a test platform this was N/A. Acoustic tests determined that there were low noise levels with no predominant tone. Positioned in front of a large industrial port with a Coal hopper in the background, so the device was located in an existing high acoustic industrial environment. No commercial fishing in the area, some coastal angling from the adjacent breakwater. The device sits on the seabed very close to the breakwater and in relatively shallow water, it was deemed that there would be no risk to local navigation.